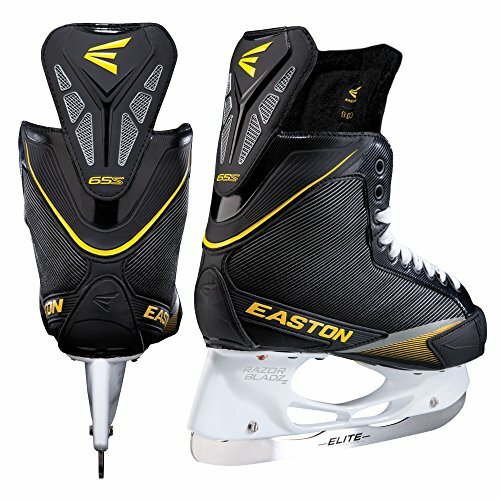 These skates qualify for speed, protection, durability, and light weight discounts, multi functional great priced skate. Combined with up to date technologies and style, the Stealth 65S Ice Skates bring a youth-like feel each time you step onto the ice. Molded Thermoformable Quarter Packages, a mouth full, simply mean the boots are anatomically molded first of all, and will also be baked to further form on your ankle’s anatomy; this lessens the break in period and helps to stop blisters. With the boot being lightweight and sturdy, the 65S’s hold true to a youth-like feel. More speed, light in your feet, and ankle toughen preventing “bowed ankle syndrome.” The 65S’s right away provide you with a quick connection to the ice with low-profile outsoles featuring Dry FlowTM. No longer handiest does this outsole let the boot flex quite along with your foot, it also allows you to feel each stride, corner, and cut straight from the ice on your feet. Dry FlowTM within the outsole is repeatedly working to keep your feet dry inside the boot, in the long run keeping your foot in place quite than sliding inside the boot on account of moisture. Each and every tongue features an anatomical profile with integrated lace bite protection which goes snug against the front of your ankle protecting you from shots, slashes, and the ever annoying lace bite. Completing the 65S’s are the Razor Bladz II Holders, designed with optimal height at the heel helping you stay power stance able, on best of Easton’s aggressive Elite Runners. The 65S’s are perfect for intermediate to advanced players taking a look to bring wisdom to their wallet – and practicality to their game.